MotorSpeak: The 107% Rule Is Back! Oh how the dregs of the F1 field will be dreading this. They thought they had it all sown up when the qualifying format changed for 2003. But now it's back! What am I talking about? The 107% rule which forces every F1 car to qualify within 107% of the fastest time set in qualifying or else they're disqualified from starting. There is very bad news if you fall fowl of the rule because the F1 Team will have already spent a fortune getting all the equipment to the track only for it all to sit idle, not to mention the risk to any sponsorship deals. The rule first appeared in 1996 to weed out those teams that used the sport of F1 purely as a marketing tool without any real ambition of progressing in the sport. And why not? After all F1 has a global audience. But FIA President Max Mosley believed F1 was the pinnacle of motorsport and that it ought to stay that way. It wasn't long before teams began to fall foul of the rule with both drivers of the now defunct Forti Team failing to qualify for the first race of the 1996 season in Australia. The rule disappeared in 2003 when the qualifying system was changed to the single lap shootout format and quietly fell off the F1 radar. Until now. Its back because the new teams this year have been at the centre of traffic chaos both in qualifying and the races. The likes of Virgin Racing, Lotus and especially Hispania will be hot under the collar as they face the real possibility of failing to qualify in future, and with it, many hopes of securing future sponsorship. Jean Todt, new FIA president, was keen to push the rule through in anticipation of yet another new team to enter F1 next year which would likely exacerbate the situation. There will be exceptions to the rule though. An a FIA statement noted "Under exceptional circumstances, however, which may include setting a suitable lap time in a free practice session, the stewards may permit the car to start the race. 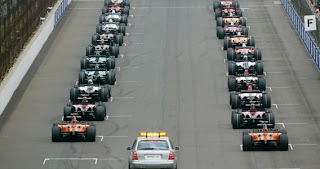 Should there be more than one driver accepted in this manner, the grid order will be determined by the stewards." If the rule was in force this year both Hispania drivers would've failed to qualify for the opening Bahrain Grand Prix. Personally I'm in two minds about the rule. On the one hand F1 must maintain its status as the benchmark of motorsport but on the other hand I'd hate to see potential new F1 teams being discouraged at all from a sport which already has so many barriers to entry. Maybe the likes of Hispania could try to bribe Red Bull and the gang to, you know, slow it all down a bit. But apart from that? The rule is arriving. To Hispania & Company: get your act together pronto!